A recent op-ed column from James Carroll at Boston.com was titled, "A solstice approaches, unnoticed". Well, obviously Mr. Carroll is not into cooking or eating. The coming of summer brings so many delightful fruits into season: blueberries, strawberries, blackberries, cherries, boysenberries, cantaloupe and for us in South Florida, Mangoes! Yes, that delicious vitamin A and C packed goodie. And while so many outside our region see it as an exotic fruit, truth is most of us down here have been eating it since we were born. The summer solstice is a celebration of the sun and a harnessing of its power to give us strength. One way to celebrate this new season, it has been suggested, is to reflect upon an area of our lives in which we need strength and to capture that energy from the sun. And here, the sun is so hot, that you can feel its power beating down. Yellow/orange like the sun is the mango's ripe flesh, perfect for Mungo's Mango Jam. Mungo, another of my dogs - a true kindred spirt - was the inspiration of this spread, since he loved mangoes and he would have delighted in the rich flavor of this jam. In looking at other recipes for mango jam, I have found that many add ridiculously large amounts of sugar. 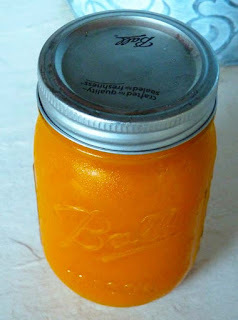 A good mango is naturally sweet and needs little, if any, added sugar when turning it into a jam. The following recipe is really easy and one that has been very well received by friends and family alike. That's it. No pectin, no water. Now, comes the dirty, rotten part of the job. The part that makes you wonder whether it's all worth it. It is. Peel and cut the mangoes. I found that an ice cream scooper does a terrific job of getting the flesh out of the bigger slices of mangoes. The tricky part is getting the meat off the pit. That is no mean feat. You may find that initially cutting it with a knife works well, but then you'll need to dig into it with clean hands to get as much pulp as you can. Next, put the mango pieces in an oversized pot. Add the sugar. Put the flame on medium-high and begin stirring. After a while, the mango will begin to break up and will seem to liquefy. Continue stirring until the mango mush (it's an accurate description) begins to simmer. At that point, lower the heat to a high low (you want it on low, but you want it to continue to simmer and cook). Let it cook, stirring from time to time. This is the second nasty bit. You do have to be on top of it and stir it fairly often. Taste the spread. It should be sweet enough if your mangoes were ripe and sweet. But you can add additional sugar to taste if you find that it is not sweet enough. In the process of making jams, I have found that if the fruit itself is not sweet, and has an acid flavor, it is very difficult to get rid of that by adding sugar. It's never really masked. Also, too much sugar makes the preserve overly sticky and too sweet. So make sure you use the sweetest mangoes available. After about an hour or so, when your arm is about to fall off, carpel tunnel syndrome means more to you than an entry in Wikipedia, and you are seriously considering whether this was a good idea in the first place, your mango spread will reduce and become thick. Take it off the fire and let it cool. The spread will also get a bit thicker as it cools. Some people like to add pectin. I do not use this preservative, as I tend to eat the jam rather quickly after making it and I always refrigerate. But for those who like to use pectin, that is an option. 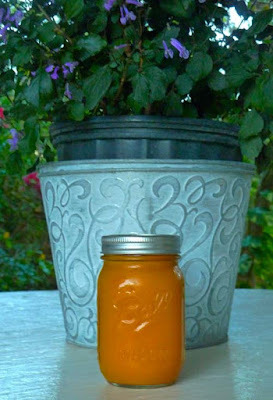 Transfer the jam to properly prepared Mason jars .... assuming it gets there and is not eaten in the process... and enjoy! An interesting set off of flavors for those of you who like cream cheese is to serve the pure jam over a bit of cream cheese. This can be spread over water crackers or eaten pure. It is delicious! Other types of cheese may work well too. Experiment and let us know!